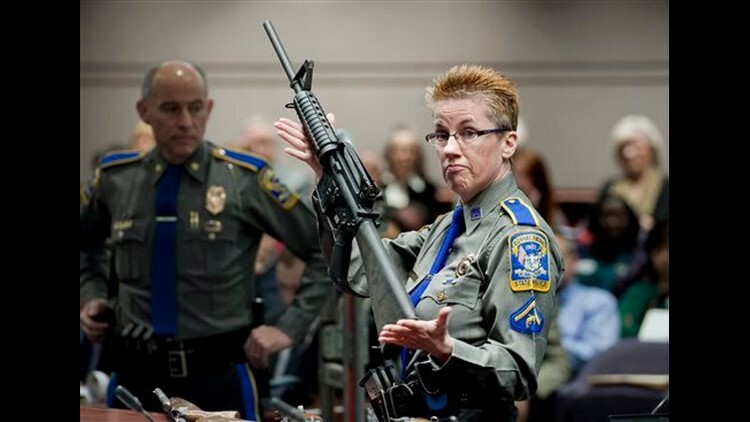 BRIDGEPORT, Conn. (AP) — Lawyers for the company that made the rifle used to kill 20 first-graders and six educators at Sandy Hook Elementary School are expected to ask a Connecticut judge to dismiss a wrongful death lawsuit filed by families of some of the massacre victims. Freedom Group, the Madison, North Carolina, parent company of AR-15 maker Bushmaster Firearms, is arguing that it is protected by a 2005 federal law that shields gun manufacturers from most lawsuits over criminal use of their products. Lawyers for the plaintiffs, who include the families of nine children and adults who died and a teacher who survived, say the lawsuit is permitted under an exception to the federal law that allows litigation against companies that know, or should know, that their weapons are likely to be used in a way that risks injury to others. The victims' attorneys say the lawsuit appears to be the first of its kind against a manufacturer to claim that exception. Bridgeport Superior Court Judge Barbara Bellis is set to hear arguments Monday afternoon on Freedom Group's motion to dismiss. "No lawsuit will ever bring back any of the 26 innocent lives that were stolen or bring peace to the families that will never recover from this," said Nicole Hockley, a plaintiff whose son, Dylan, was killed. "But gun companies must be held accountable for marketing and selling the AR-15, a killing machine designed only for military use, to violence-prone young men. "We're bringing this lawsuit to save other families from having to live with the nightmare that we do every single day," she said. State police say the 20-year-old gunman, Adam Lanza, killed his victims with a Bushmaster XM15-E2S rifle, a model of the AR-15, on Dec. 14, 2012. Lanza killed his mother, Nancy Lanza, at their Newtown home before going to the school a few miles away, and then killed himself as police arrived. Nancy Lanza legally bought the rifle, state police said. The plaintiffs' lawyers, Joshua Koskoff, Alinor Sterling and Katherine Mesner-Hage, argue in the lawsuit that the Bushmaster rifle used in the shooting is too dangerous to sell to the general public. The families are seeking unspecified monetary damages and other potential court actions. Freedom Group denies the allegations. Lawyers for the company argue that Congress passed the 2005 law, the Protection of Lawful Commerce in Arms Act, to protect gun makers from lawsuits over the criminal use of firearms, after determining the lawsuits were an abuse of the legal system. Debate over the law has resurfaced in this year's presidential campaign. Hillary Clinton has criticized fellow Democrat Bernie Sanders' support of the 2005 law when it passed. Sanders is now backing a bill to repeal the law.